The Tamil National Alliance (TNA) demanded yesterday that foreign judges be included in a special court to investigate war crimes, a day after the United Nations (UN) again granted Sri Lanka more time for a much-delayed probe. Government troops have been accused of human rights violations in the final months of the island nation’s civil war in 2009, however no one has been prosecuted for war crimes in the decade since. With no measurable progress, the UN Human Rights Council in Geneva on Thursday gave Sri Lanka two more years to set up a credible investigation, the second time it has been given an extension. The probe is meant to include a special “hybrid” court involving both local and foreign judges and prosecutors. But on Wednesday in Geneva, Sri Lankan Foreign Minister Tilak Marapana said the country’s constitution did not allow foreign judges. This prompted uproar from TNA, with lawmaker M.A. 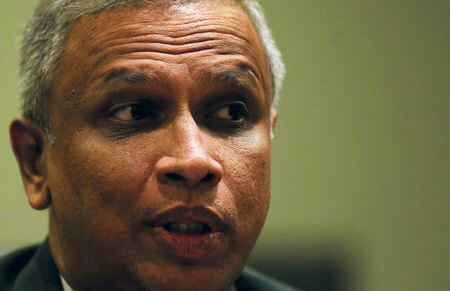 Sumanthiran threatening yesterday to report Sri Lanka to the International Criminal Court (ICC). “If the government does not agree to a hybrid court, Sri Lanka will have to face a tribunal which will be entirely international,” Sumanthiran said in parliament.